Workers of the world are pissed, Truthseekers. And who can blame them? Global unemployment has hit a high water mark not seen since the 1920s, workers rights continue to be eroded, corporate scandals abound, and bad labor practices -- even by "good" companies like Apple Computers -- have become the norm. Here at home, today's young people -- for the first time in American history -- cannot expect to earn as much as their parents, or even their grandparents, did. Small wonder we are uninspired and despondent, with a future so bleak you gotta take Paxil. "Banging drums and waving flags, hundreds of thousands of workers marked May Day in European cities Tuesday with a mix of anger and gloom over austerity measures imposed by leaders trying to contain the eurozone's intractable debt crisis. Under a gray, threatening Madrid sky that reflected the dark national mood, 25-year Adriana Jaime confided she turned out because she speaks three foreign languages and has a masters degree as a translator -- but last worked for what she derided as peanuts in a university research project that was to last three years but was cut to three months. Jaime has been unemployed for six months, and sees her future as grim at best. 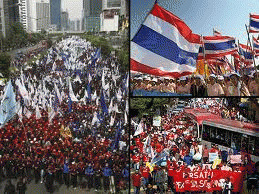 "Workers shout slogans during Tuesday's rally to mark May Day in Jakarta, Indonesia. "Taking the baton from Asia, where unions demanded wage increases as they transformed the day from one celebrating workers rights to one of international protest, workers turned out in droves in Greece, France and Spain -- the latest focus of a debt nightmare that has already forced three eurozone countries to seek financial bailouts. "In the United States, demonstrations, strikes and acts of civil disobedience were planned, including what could be the country's most high-profile Occupy rallies since the anti-Wall Street encampments came down in the fall." How much longer will the middle class continue to be ignored and marginalized by NeoCon politicians who are concerned only with the care and feeding of their corporate masters? How many Koch brothers' policies and Scott Walker-style labor abuses will we be forced to endure before there is the kind of mass protest that cannot be ignored? The occupy movement is a good start, but more needs to be done. And did you see former CIA director Jose Rodriguez on CBS' 60 Minutes Sunday, defending the US torture practices? His TV appearance coincided with the release of his book, "Hard Measures: How Aggressive CIA Actions after 9/11 Saved American Lives," a memoir that details his years with the Bush Crime Family. He sees no problem with his ordering the destruction of thousands of hours of video tape documentation of waterboarding and other torture techniques used against alleged al Qaeda members (many of whom were completely innocent). Instead he -- in Orwellian fashion -- blames the Obama administration's efforts to reprimand him for his blatant destruction of evidence. "Rodriguez reveals in the book that he received a formal letter of reprimand from the CIA last December as a result of the destruction six years earlier of the videotapes of the harsh interrogation sessions, even though Rodriguez says he was told that their destruction was legal. "'The practical implication of the letter is nil,' Rodriguez writes. 'But in my view, the letter and the entire process are an embarrassment -- to the agency, not to me.' He said he was not allowed to keep a copy of the classified letter of reprimand. If it is ever declassified, 'I'll have it framed,' he writes. 'To me, it says: Courage to Act.'" Well, to me it says "war crimes." Also "destroyed moral authority," "ravaged global reputation," and "increased risk of retaliatory terrorist threat." If he's okie dokie with simulated drowning, I bet ol' Jose has no problem with soldiers urinating on dead Muslims, or piling them into naked human pyramids, or leading them around on dog leashes, or defecating on their Holy books, or leaving them to die in sweltering boxcars. Hard to be proud to be an American these days, isn't it Truthseeker?